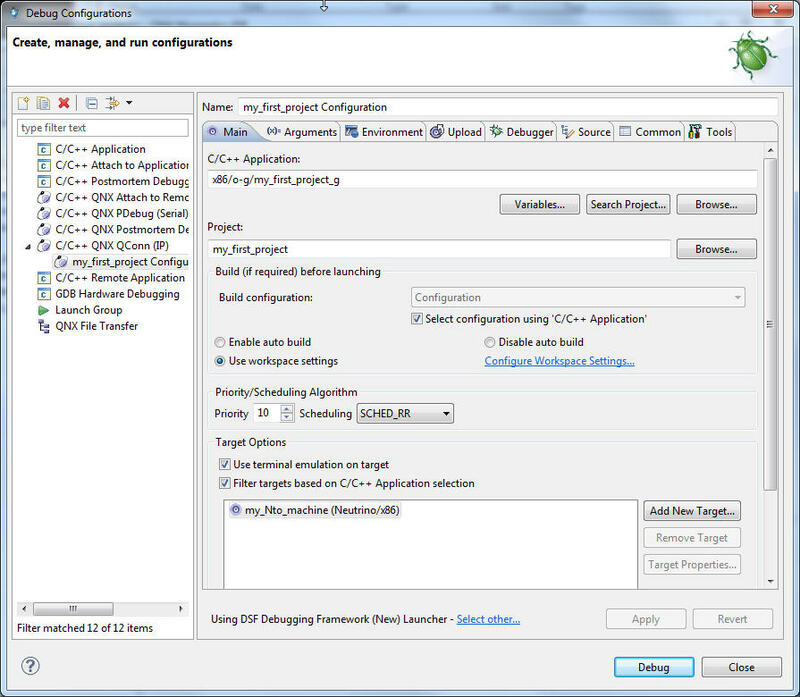 To run and debug the newly built program on your target system, you need to create a launch configuration. It consists of various settings that affect how the program starts (e.g. command-line parameters, environment variables). You enter these once, and then you can use this collection of settings again and again. You will now be presented with many configuration possibilities that all deal with starting your executable program. Right now, only the Main tab needs your input. Later, however, you should also take a look at what the other tabs have to offer. If you wish, you can change the name of your configuration at the top of the dialog. If your project isn't already selected, click the Browse. . . button beside the Project field, and select your project. Next to the C/C++ Application field, press the Search Project button and choose your binary. The names of binaries compiled with debug information include a suffix of _g. Since we would like to start the Debugger in the next step, please choose the binary with the debug information. Click OK.